With a single input connector single-phase or three-phase, the PDU unit ensures a reliable power distribution supply to output sockets for small and medium power devices for Rack cabinets. 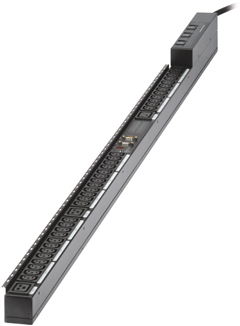 With it’s side mounting rear side of the Rack cabinet, the PDU requires less “unit” space. It also simplifies the electrical connections of the several devices and optimizes the Networking High Density solutions. The standard mounting brackets provided allow the installation on different Rack cabinets. The large IEC320 standard connections allow time saving, safe and tidy installation and easy modifications of the power supply configuration. 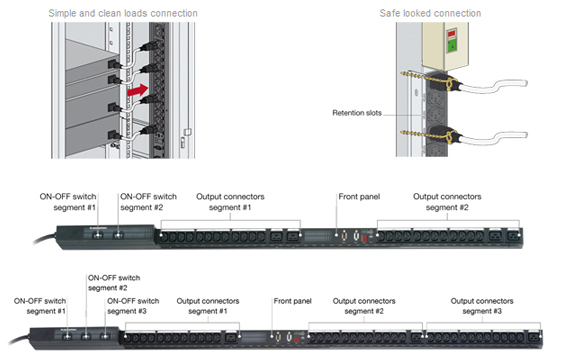 When required, it is possible to install two PDUs into the same Rack cabinet to develop redundant power architectures, typical of Dual Cord devices (Critical Application). The two-digit LED display allows an easy reading and monitoring of the current consumption. The Reverse Display function allows the cable input both from above and below, ensuring a proper reading in every installing position. The ADD-IN SNMP module (available as an option), allows the remote control and monitoring of the PDUs via LAN network.